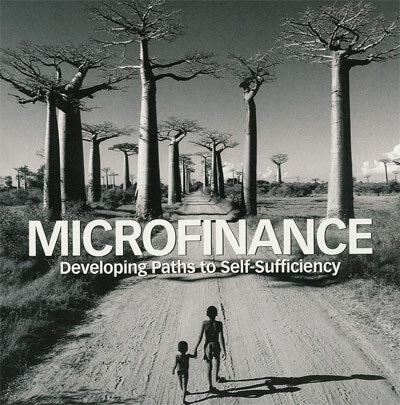 Microcredit is the extension of very small loans (microloans) to impoverished borrowers who typically lack collateral, steady employment and a verifiable credit history. It is designed not only to support entrepreneurship and alleviate poverty, but also in many cases to empower women and uplift entire communities by extension. In many communities, women lack the highly stable employment histories that traditional lenders tend to require. Micro-credit provides a means of escaping the poverty trap: Low income individuals can borrow money at low interest rates without the need of collaterals and thus break the poverty trap. They can generate/increase their incomes. Micro credit given to women allows them to improve their physical and social well-being, and gives them the opportunity to raise the standards of living for their children. Micro-credits create employment opportunities for the community. An individual starting a business by taking micro-credit not only creates employments for self but also generates employment for others. There is no need of collaterals to access micro-credits. This gives access to people who are unable to obtain loans from financial institutions as a result of having no security to offer. Micro-credit may save people from ‘loan sharks’ by offering loans at lower interest rates. Micro credit fosters self-reliance and the use of entrepreneurial skills through self-employment. Micro-credit may cause the government to feel that it no loger needs to invest in poverty-reducing programmes. There may be insufficient regulations of the growing informal sector, resulting in new avenues for ‘loan sharks’ to take advantage of impoverished borrowers. Many people who take micro-credit loans are not natural entrepreneurs and do not have appropriate business experience. This makes it quite possible that they will be unable to pay back the loans. Businesses started with micro-credit loans are likely to remain small; while they might help individual borrowers out of poverty, this might not make a significant dent in overall poverty in the society. In order to ensure that micro-credit loans reach the people who need them the most the government needs to have a very efficient and well oiled system. However, in this is not ususally the scene in third world countries, where the micro-credit loans don’t reach the target population due to wide spread corruption and mis-management.